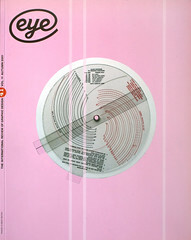 This issue features Eye’s second redesign in its ten-year history – there hasn’t been a change in fonts and logo since the redesign for Eye no. 21 vol. 5. Some decisions have been influenced by our work on the forthcoming website – and our plans for the future – rather than any dissatisfaction with the old design. The old design was reliable, readable and remarkably flexible as a vehicle for all kinds of content, though we felt that the display face Bell Gothic, originally chosen for its ‘quirkiness’, had lost its charm. The use of Anna Gerber’s term mistake-ism for the chance and accident-provoked work in this issue provoked varying reactions: most people don’t like to be thought mistaken, though they are quick to pin the word on others. Just about every decision, from a political campaign to a choice of typeface, can be described as a mistake by someone who disagrees. So we used the piece as a starting point for a collection of work that uses chance, happenstance and other arbitrary factors as a means to an end. Jessica Helfand’s collection of wheel charts were a pleasure to deal with, from the big metal ones used in farmers’ markets to the more delicate ones displaying essential information about cooking or nuclear fallout. In each case, a jumble of information on the lower dial is brought into order by the diecuts in the top one – Jessica uses this as a launch pad for some thoughts about the relationship of circles to computer-based interface design. Steven Heller’s was a more unpleasant collection, reflecting an ambiguous glory on the largely anonymous designers and illustrators recruited to beat both aggressors and the oppressed alike with the power of the pen, brush and paper. Neville Garrick, the subject of this issue’s Reputations, is a great case history for designers who yearn to become more fully involved with the content of their work. Starting with album covers for the great Bob Marley, his remit eventually included illustration, photography, jamming with the band on stage and lighting the live shows. Garrick studied at UCLA at the time of the student unrest documented in Right On! Michael Worthington’s Archive feature for this issue shows this little-known paperback, another fascinating integration of form and content that is politically more subtle and ambiguous than it first appears.